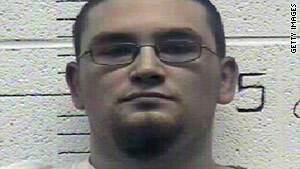 Paul Schlesselman of West Helena, Arkansas, pleaded guilty to plotting to kill several African-Americans in 2008. Washington (CNN) -- An Arkansas man has pleaded guilty to plotting to kill several African-Americans in 2008, including then-presidential candidate Barack Obama, the Justice Department announced Thursday. Paul Schlesselman of West Helena, Arkansas, faces 10 years in prison under a plea agreement reached with federal prosecutors in Tennessee. Federal officials in Washington said Schlesselman threatened to kill then-Sen. Obama on October 23, 2008, shortly before the presidential election. He also planned to "murder dozens of people with a focus on murdering African-Americans" the Justice Department said. "Despite great civil rights progress, hate-fueled violence remains all too common in our country, as illustrated by this unthinkable conspiracy," said Assistant Attorney General for Civil Rights Thomas Perez in a statement issued by his Justice Department office.